Living in New York City I've missed out on the building decoration craze that's sweeping upstate New York, Ohio, and Pennsylvania, if not other places. Barn stars! This particular example is in Mexico, but I saw plenty of them in towns and in the countryside on my trip. Single stars, multiple stars, same-sized stars and different-sized stars. Wooden barn stars were a decorative element that were often added to barns in German and German-American communities as early as the 1700s. 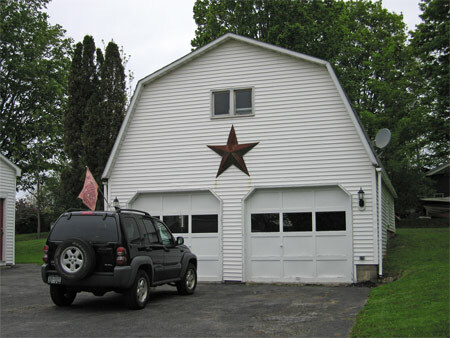 More recently, barn stars made of tin have become popular. The older style stars have largely disappeared but the tin stars are all the rage. i think you can buy them at walmart. We have a lot of them in MA lately. Barn stars haven't taken over Kansas yet. tien - I've seen them at the flea market at 77th and Columbus as well. cheryl - you just wait, you just wait. Nooooooooooo! Not barn stars! We don't need no trendy barn stars here.